In my recent absence, I’ve seen a lot of articles on food and now I’m really confused. Carbohydrates are good for performance if you’re an athlete but unhelpful in maintaining the waistline if not. In sugar form? Don’t even think about it, that’s now the devil incarnate according to the media and is the current bad boy of processed food, being used to replace the flavour lost in our quest for ever ‘lower fat’. The upshot is – I’ve stopped worrying about it all honesty. Proper butter is high in calories and cholesterol, I know that, so we use less of it. Mayo? I normally make my own and bear witness to the amount of oil going into it so the same goes. Fresh bread is delicious, just don’t go mad. It’s all about balance isn’t it? So, if you make from scratch wherever you can (or buy non processed ingredients at least) I don’t think you can go far wrong. 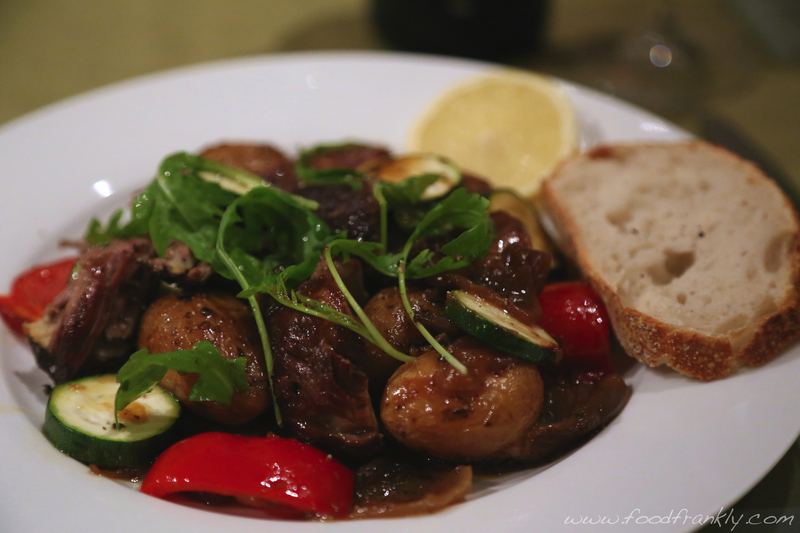 So that said, here’s a dish which includes salt, sugar, saturated fats, carbs and dairy. All in moderation, of course, and a glass of decent wine to wash it down. 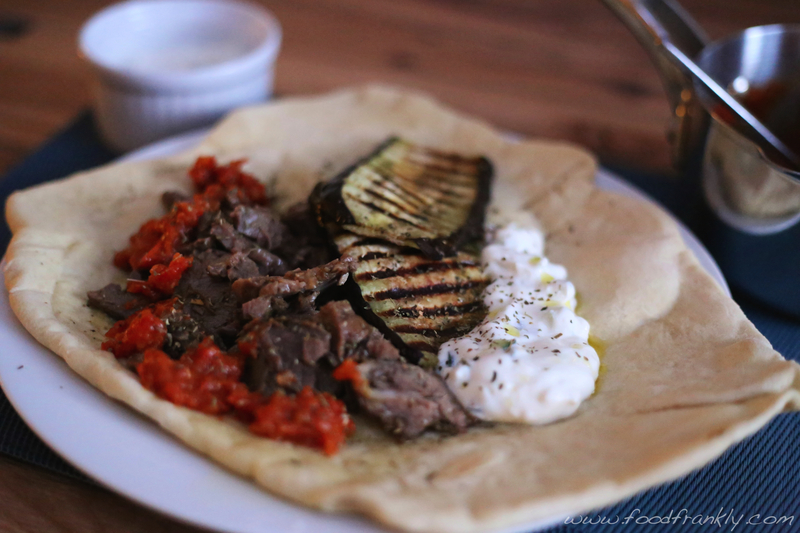 I make lamb kleftiko a lot as it’s one of those dead-easy one pot Sunday specials you can leave in the oven whilst you get on with the rest of the day. I was actually going to post it before, but never got round to it. 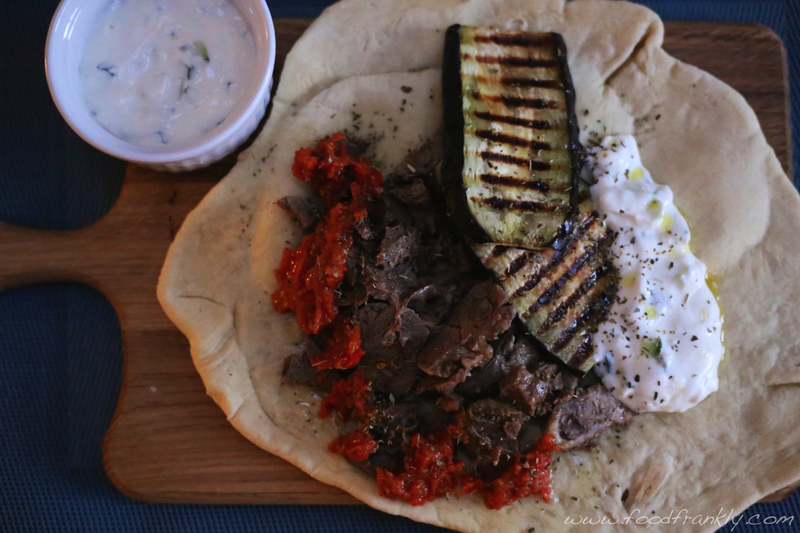 This is a slightly different take on it – a sort of Gyro with tzatziki, fresh tomato sauce and grilled aubergine. It may invoke distant memories of dodgy kebabs eaten in post-pub youth, but this is a world away from those spinning mystery meats. Considerably better for you too. 1 sprig each of thyme & rosemary. 1 small tub greek yoghurt. Lemon juice and salt, to taste. Olive oil and oregano to serve. 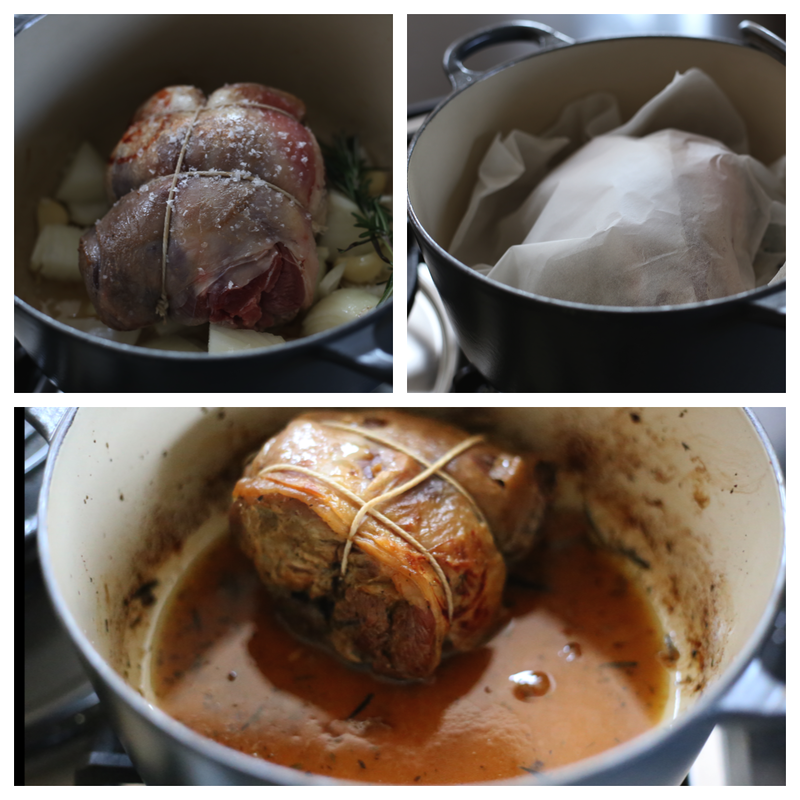 In a lidded pot, heat the oil and brown the lamb. Add the rest of the ingredients, cover tightly with baking parchment and the lid. Place in a low oven at 130°C/260°F for 4 hours. Longer the better. For the last hour, start the bread by combining the ingredients and knead. I use the dough hook on a mixer, but knead until smooth and the dough can stretch thinly without tearing – 5 minutes with a mixer or 10 minutes by hand. Cover the dough and leave to prove. Once done the lamb should be almost falling apart. Pull it apart and place in a tray. Pour over the cooking liquor, but keep the onions and garlic for later. Cover the tray with foil and keep warm, or just reheat it later. 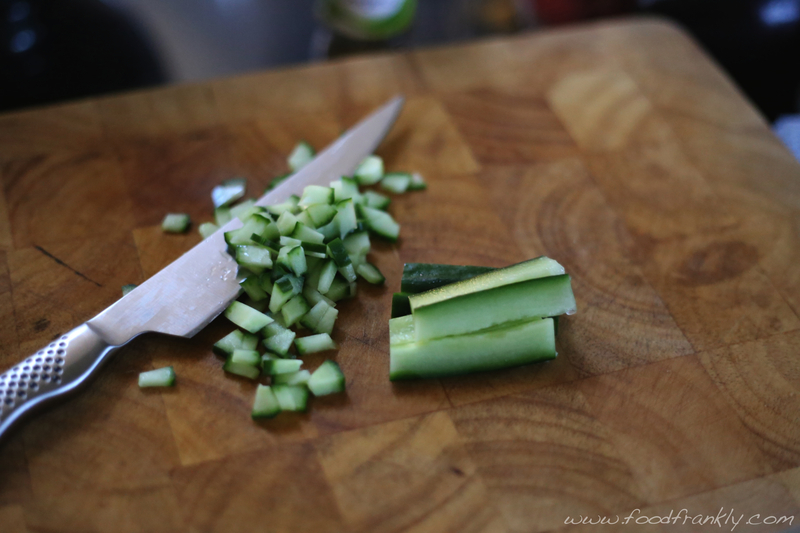 For the tzatziki, just combine the ingredients and set aside. I prefer to do this a while before to let the garlic ‘mellow’ a bit. For the tomato sauce, blitz the tomatoes, 3 garlic cloves and the onions from the lamb. Heat though in a pot and stir in the sugar and salt to taste, if needed at all. Slice the aubergine fairly thinly, drizzle with oil and season. Griddle them on a hot pan until charred and tender. Meanwhile, heat the oven to maximum – use a pizza stone if you have one. Roll out the dough in a circle to the size of oranges for big wraps or the size of golf balls for small ones. Cook on the oven stone, but be careful not to crisp it up too much or it won’t wrap. 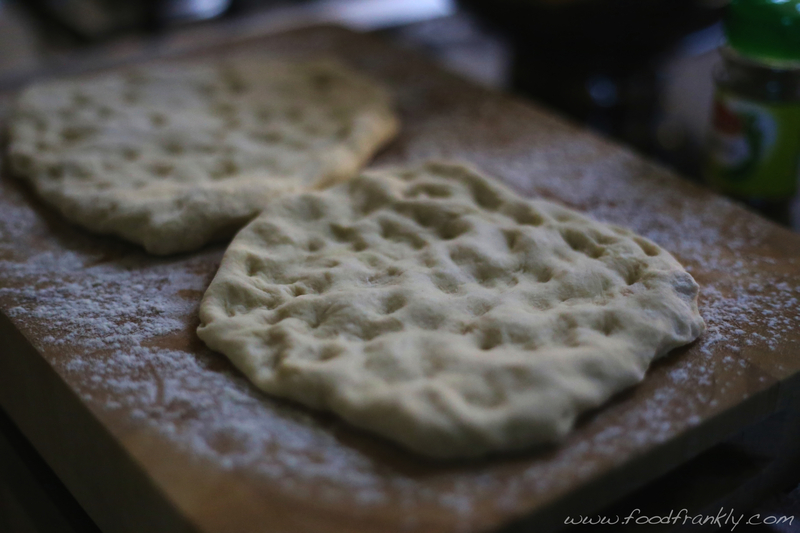 Which is kind of the point of flatbread wraps…. If you prefer, you can cook the wraps on a hot iron skillet, like tortillas. Once ready, serve it all up on the flatbread with a little extra virgin olive oil and some more oregano. 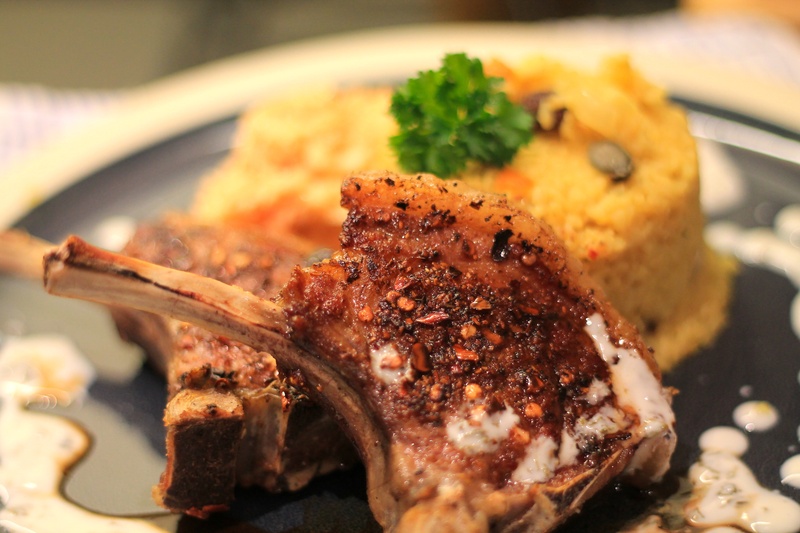 Ordinarily, this would have been a shoe-in for the barbecue – hot spice rub and lamb still on the bone is heaven for me. It is still January (just) and therefore in order to prevent the neighbours sending round the men in white coats, I thought I’d get the iron griddle pan out. I got the lamb, ready trimmed, at a good butcher in the Fenwicks department store Newcastle. I rubbed with a Harissa spice mix from the mmm… deli in the local market. It was very good actually but I think I’ll give it a go myself next time. I finished it off with a simple yoghurt sauce made from some home-made mint sauce, pinch of sugar and, of course, yoghurt. Keeping with the theme, I made a side dish of bulgar wheat using North African type ingredients and flavours including turmeric, raisins, cinnamon and cumin. I know that cous-cous is the usual choice here, but I actually prefer bulgar wheat as it has a much better texture in my opinion. It’s also high in fibre and low in GI, which, I’m told, is a good thing. I finished the thing off with a spicy fresh made coleslaw, using a little of the harissa spice and paprika to add a bit of ‘zing’. 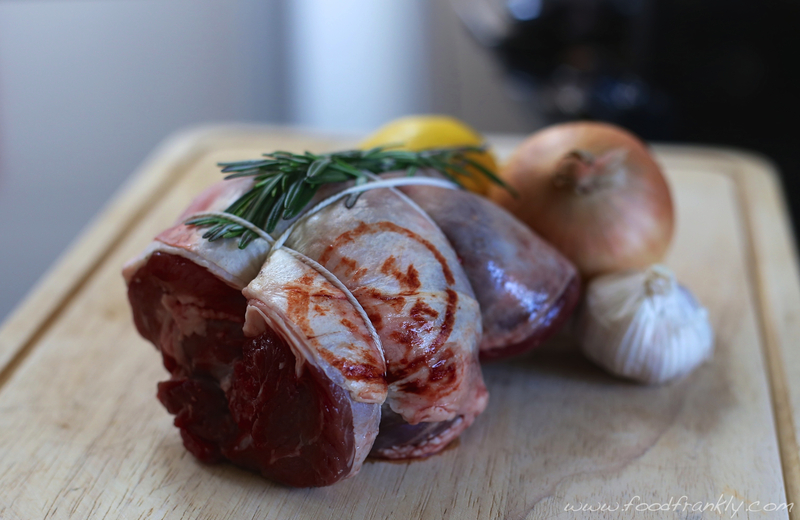 (Spoon the mix onto the lamb and leave to marinade in a food bag overnight or for as long as possible). Make up the stock with boiling water (I used cubes as I didn’t have any made up). Fry off the onions and garlic in a little oil in a medium pan (with a lid). When soft, add the bulgar wheat, dried fruit, nuts, spices and the stock. Bring to a boil, cover and turn the heat off. After about 15 minutes the water will have been absorbed. Taste and add a little more boiling water if underdone. Season with salt if needed. Heat the oven to 180ºc/350ºF. 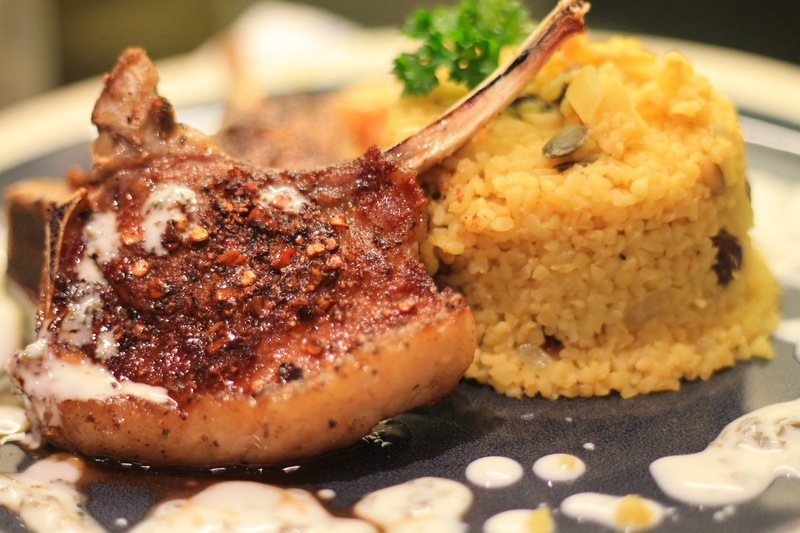 Heat the griddle pan until searing hot and place the seasoned lamb cutlets on. Seal for a few minutes and turn them over. Pop them in the oven for about 5-10 minutes – I like them still pink. Whilst doing this make a blazing quick coleslaw: blitz half an onion, a handful of white cabbage and a small carrot in a food processor. Empty into a bowl withth spice spice and mix through enough mayo to coat. Make the mint sauce by simply combining the ingredients.